ATN NVGOPS15H0 PS15-HPT Night Vision Goggles FREE SHIPPING! Compact, lightweight and ultra-durable, the new PS15-HPT Night Vision Goggles from ATN are powerful low-light optics optimized for military and tactical application. Featuring dual image intensifier tubes and precision-cut, multi-coated optics, the goggles offer superior light transmittance needed for total vision clarity regardless of the environment. By utilizing two light processors instead of one, the goggles are able to deliver improved depth perception and accommodate rapidly changing conditions inherent to tactical fieldwork. Perfect for covert operations, the goggles are equipped with a built-in, infrared illuminator that provides detailed image contrast needed to read maps and building specs without using any form of additional light. This allows users to conduct missions in total darkness without giving away their position. Built to handle any environment, the PS15-HPT is completely waterproof and comes with a flip-up head mount for convenient, hands-free operation. 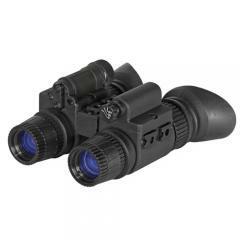 ©2002-2019 CopsPlus.com: ATN NVGOPS15H0 PS15-HPT Night Vision Goggles FREE SHIPPING!